Lot and his family escape from Sodom before it's destroyed. HE LONG SHADOWS of evening-time were stealing over the through the valleys, and everywhere people were hurrying home. Soon the city gates would be closed, and the wise men who sat there during the daytime to judge the people would be turning homeward, too. Among the wise men who sat in Sodom's gate was Lot. On this evening he saw two strangers approaching, and he greeted them with a low bow, just as Abraham had greeted these same men earlier in day. For they were no other than the angels who had dined with the Lord at Abraham's tent. Lot invited them to his home to spend the night, but they said they would stay out in the streets. Now, Lot knew the wicked men of Sodom would try to harm them if they remained in the streets, so he urged them to come with him. Finally they consented. Here again the angels were entertained with hospitality, which may have reminded them of Abraham's kindness, for Lot brought water to wash their dusty feet and prepared good things for them to eat. Possibly Lot did not yet know that they were heavenly beings; but he thought they were strangers unlike the wicked men who lived in that city. Soon the news spread all over Sodom that Lot had two strange-looking visitors at his home, and men came hurrying from every part of the city to see them. They planned to hurt them. But when Lot refused to let them see his guests, they pushed him aside and tried to break open the door. At this the angels drew Lot quickly inside, and then smote the men with blindness. Now Lot knew that his visitors were angels, and that they had come to destroy Sodom because it was such a wicked place. He went out to the homes of his sons-in-law, two men of Sodom, and told them that the Lord was going to destroy their city. But they would not believe his words. And they would not listen when he told them to hurry and escape for their lives. So the night passed by. When the early morning came, before the sun lightened the earth, the angels urged Lot and his wife and their two daughters to make haste and flee out of the city lest they also be destroyed. How hard it seemed for Lot to leave his home and his riches to be destroyed! God was merciful to him, and the angels seized him and his family and dragged them outside the city. Then they bade them flee to the mountains for their lives, and not even pause long enough to take a backward glance toward their old home, because God would soon destroy the cities of that rich valley, and unless they hurried away they too should perish. But Lot's wife did not obey the angel's words. She looked back, and her body became changed into a pillar of salt. Poor, unhappy Lot! fear now tormented him from every direction. He thought his life would not be safe even in the mountains, for wild animals might devour him there. So he prayed to God to spare a small city near by and allow him and his daughters to enter that place. God heard his prayer and granted his request, so they fled into that city. That place was called Zoar, which means little. Just as the sun rose, Lot and his daughters entered the gate of. Zoar, and at that time God sent a great rain of fire and brimstone upon Sodom and Gomorrah and all the neighboring cities. 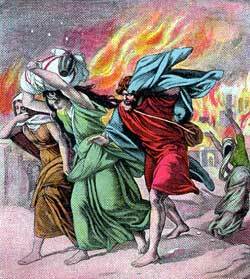 So terrible was the fire that it completely destroyed the cities and all the wicked people near by. Lot and his daughters feared that their lives were not safe in Zoar, so they hurried to the mountains, where God had first told them to go. There they lived in a cave-home, far away from other people. After this time we hear no more about Lot, the man whose home and riches were destroyed because he chose to live among wicked people who hated God.